1. Use Acrobat Typewriter Tool to fill in “nonfillable” forms. 2. Need to send a large attachment? YouSendIt or Megaupload. 3. If you want to follow a site that doesn’t have RSS, use Page2rss. 4. Avoid eye strain when trying to read websites by using Readability. 5. Check out the iPhone J.D. blog. 6. Want to avoid endless e-mails to set up meetings? MeetingWizard.com. 7. Why not save client money by having motion docket via video conference? 8. Speaker asks: Why aren’t lawyers lobbying courts about antiquated time-wasting processes? 9. Hourly billing can operate as a disincentive for law firms to modernize. 10. 2009 was a big year for alternative fee arrangements between Big Law and corporations. 11. Want to see your phone on desk top? Sparus EveryWAN. 12. TrueCrypt is an open-source free program to encrypt hard drive. 13. Need to meet with out-of-state property expert? Combine GoToMeeting, Skype and Google Earth. 14. YouSendIt is a good way to share docs and video, plus it provides a record of who opened it. 15. Freeconferencecall.com: A free tool that saved one lawyer’s ski trip. 16. Giveawayoftheday.com: Free license to one shareware program each day. 17. For real estate lawyers, Google Earth is a good research tool and has been used at trial. 18. Mozilla Firefox is a great browser that also has fantastic add-ons. 19. More solo lawyers are moving to virtual practices. It cuts overhead, and more clients are embracing meetings via Skype. I’ve read several posts recently about Twitter and law firms. Although this topic has been around for the last couple of years, it seems like the importance of Twitter is part of the conversation again. One post in particular caught my eye, because it made so much sense. In her post, Amy Campbell outlines five quick and easy reasons why law firms should have a Twitter presence. Search engines eat it up. The best way to learn it is to do it. Build your Twitter infrastructure and network now, for when you need it later. It appears to me that only six of the 20 are using Twitter in any meaningful way, and four more have just dipped a toe in the stream. Four of the firms I could not find on Twitter at all, and six others appear to have reserved their handles, but aren’t using them. For example @whiteandcaseLLP is a valid account, but it is locked. Is this the real White &Case, or has a Twitter squatter (or sqwitter) reserved the handle in violation of Twitter policy? As Amy points out on her post, at a minimum these firms should be protecting their brands on Twitter. Of those who are taking full advantage of Twitter, only one firm, McDermott Will, mentions their Twitter presence on their web site: one short sentence on their ‘Contact Us’ page. Considering the fact that Reed Smith has almost 1,000 tweets, I am especially surprised that they do not mention Twitter on their site. Why are these firms not promoting their Twitter updates in a more prominent way? What’s going on beyond the top 20? Here is a Twitter list that Amy put together of firms that tweet. 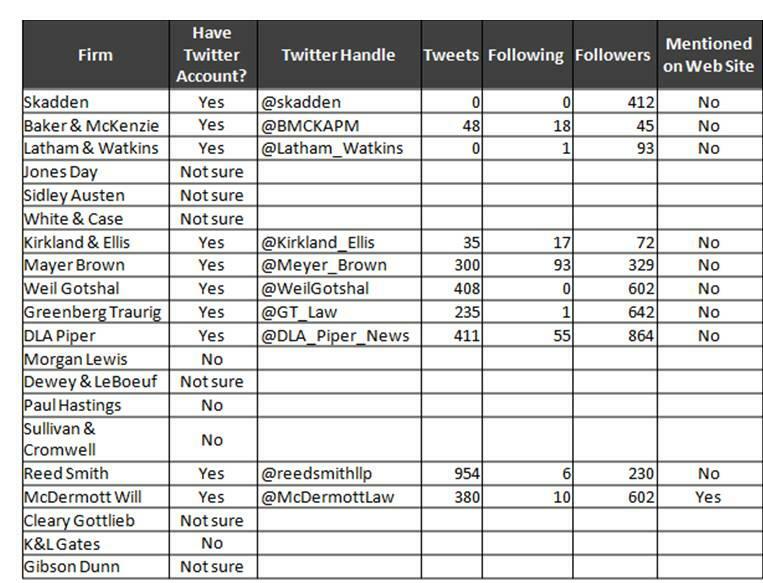 Also, JDSupra created a list of legal professionals on Twitter in 2008. The size of the original list, 145, has grown exponentially over that last two years. The latest update was in August of 2009, and the list stood at 750. I would love to hear from any of the top 20 firms mentioned in my list, especially if I got something wrong about their Twitter presence. In the meantime, don’t be afraid to jump into Twitter and give it a try!